Have you ever wanted a ride-on lawnmower that doesn’t need petrol or diesel to run? Now is your chance! On Donedeal you can buy a ride-on lawnmower that runs on grass and it emits minimal noise. For just €60 you can get yourself this one-off model from Jim in Ballybofey, Donegal. Jim posted the advert on Donedeal several days ago and all the information he provides is simply: “Ride on lawnmower, needs no fuel, noiseless. Going sheep”. The picture of the lawnmower explains exactly what you’re getting from the pocket-friendly price of €60. 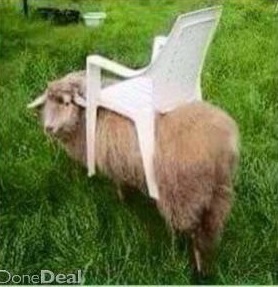 Jim’s grass cutter is a sheep with a patio chair on it’s back and if you would like to buy this ‘sheep-mower’ you can contact Jim directly via message on Donedeal. Compared to other well-know lawnmower brands such as Honda and Husqvarna, this lawnmower has been viewed online almost 20,000 times by prospective buyers. Having a sheep as a grass cutter would have benefits; there would be no need to buy chemicals or pay fuel costs. Also there is no need to pump any tyres or check the machine’s blades. When not mowing the lawn, the sheep can rest in a shed or be moved into another field. Table: How many tractors of each brand are there in Ireland?